Cook pasta to al dente according to package directions. Drain and set aside until ready to use. In a large, deep skillet, heat olive oil. Add chicken and season with a pinch or two of salt and pepper. Cook until chicken is no longer pink, about 5 minutes. Transfer to a plate and set aside with the pasta. Add 3 tablespoons of butter to the skillet and melt, then stir in garlic and cook for 1 minute. Stir in flour and italian seasoning cook for about 1 minute or until golden. Whisk in milk and chicken broth and simmer for several minutes until thickened. 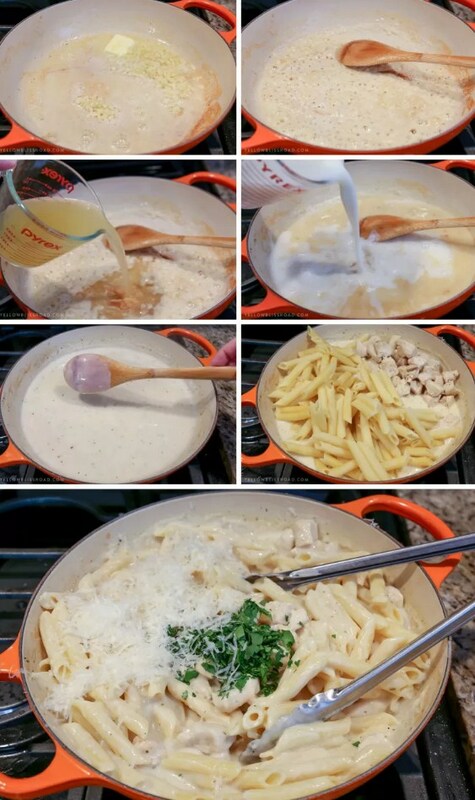 Remove from heat and stir in half of the Parmesan cheese until melted. Toss the cooked pasta and chicken with the sauce to coat, then stir in remaining Parmesan cheese and ¼ cup fresh chopped parsley. Serve immediately, garnished with fresh grated Parmesan and fresh chopped parsley.